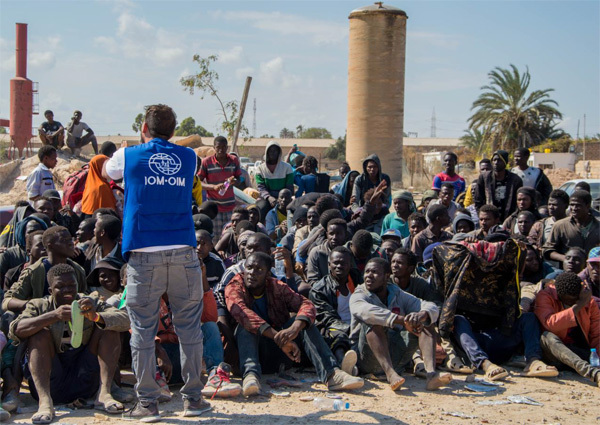 Tripoli – This week (21/11) Libyan authorities, with the support of IOM, the UN Migration Agency launched the Migration Working Group under the auspices of the Coordination Framework for International Technical Cooperation with the State of Libya. Co-chaired by the Ministry of Foreign Affairs and IOM, the Migration Working Group is one of the six working groups of the Coordination Framework, endorsed during the Senior Policy Committee meeting held on 18 July 2017 in Tripoli. The launch, held at the Ministry of Planning, chaired by the Head of the European Affairs Department of the Ministry of Foreign Affairs, Jaalal Alashi and co-chaired by IOM Libya Chief of Mission Othman Belbeisi, was attended by representatives of relevant Libyan Ministries, a high-level delegation from IOM HQ, Ambassadors and Embassy representatives, as well as other UN agencies. This working group aims to coordinate respective strategy and policies on migration and to serve as a platform for constructive dialogue on migration aiming to provide actionable tools and practical solutions to govern migration effectively with respect of human rights, and to reduce the impact of irregular migration. “The Libyan authorities reaffirm the importance of the establishment of this working group, which is highly timely, and we look forward to working closely with the international community in general and IOM in particular in order to overcome the outstanding issues and develop ways to deal with the phenomenon of migration that concerns the entire region,” said Alashi. “We are hoping that the launch of this working group will serve as the first step towards efforts to manage migration for the benefit of all,” said Belbeisi. A number of sub-groups will be launched in order to cover key priority areas such as labour policies, border management and health-related issues.